We are fixated on the idea of freedom, yet most of us live in prisons of our own making. Stress, unhappiness and addiction are often the result of our failure to understand what it really means to be free. This challenging book provides a much needed wake up call to help us recognize, and escape from, the trap. In many ways we have never been more -free'. We are freer to follow our dreams, set goals and live the life we choose. Yet mental health issues and social disharmony are sky-rocketing. Anxiety and depression are rife and more people feel overwhelmed by daily living. We are increasingly addicted, distracted and pressured. Now we have more but are more in want. This is a world that increasingly seems to breed discontent. So, is all our so-called freedom nothing more than a trap of our own making? Are we simply decorating the cage that keeps us imprisoned? Associate Professor Craig Hassed, the author of 11 books, is a leading expert in mindfulness, regularly invited to speak and run courses in Australia and overseas in health, professional and educational contexts. 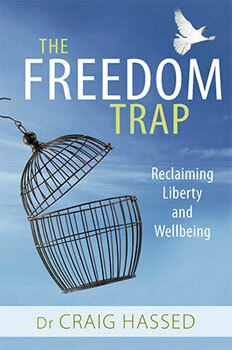 Question: Why did you write The Freedom Trap? Craig Hassed: Because I, like everyone else, want to be more free. Yet we often find ourselves anything but free, trapped by anxiety, worry, habits, compulsions, fear, anger and many other things. Then there is the way the world is increasingly racked by mental health problems, chronic illness, climate issues, social inequity, conflict and a polarized political climate. I wondered how we got into such a situation? Are there any common links or clues? Perhaps true freedom is not what we at first take it to be. Can being ruled by pleasure and desires sometimes become a sweet but sticky trap? Maybe there is a delicate balance between the right of individuals to assert their personal autonomy versus the reasonable limits that we should set individually and collectively. Where that point of balance lies is a topic of hot debate, if we go too far one way we limit people's potential fulfilment, if we go too far the other way we may find ourselves in a state of disorder, vulnerability and unhappiness. I therefore got interested in inquiring into the nature of freedom itself and wanted to see how contemporary views of freedom compared with views from the world's great wisdom traditions, as well as looking at it from scientific, psychological, political, legal and ethical perspectives. Question: What will readers take from The Freedom Trap? Craig Hassed: We are all in this together. We all have the so-called 'human condition'. I wanted to raise a lot of questions and hopefully respectfully challenge us to look and think again. It's not so much about taking any dogmatic positions on any particular contemporary issues but hope that readers will sincerely reflect on the questions raised and, having reflected, come to a deeper insight as to how to foster freedom and happiness in their own lives. Question: What does freedom mean, to you? Craig Hassed: For me, I am working on the assumption that freedom relates closely to wisdom. It is first and foremost an inner state of self-knowledge, balance and harmony. From that state one can interact with the outer world and lead a wiser, healthier and happier life. That includes being compassionate and just to those around us. In this age of what some have called the 'me generation', our pursuit of personal freedom and happiness should be in full consideration of the freedom and happiness of others. Question: How does stress impact our freedom? Craig Hassed: Stress as a temporary response to escape a tiger is an adaptive, healthy and potentially life-saving response. Stress as a state that we activate within ourselves for no good and immediate purpose can be maladaptive, unhealthy and make us unhappy. The inappropriate or excessive activation of the stress response is largely based on a distracted mind full of worry and rumination. There is no freedom in that.